"Why this had to happen like this? To everybody that you know and love? At one time?" Cora Jones was diagnosed with breast cancer in December, then lost her job and had to move, but Sunday was supposed to be a nice evening with her family that would include cooking her mother's favorite food, sweet potatoes. Instead, it was a calamity, NBC News reported. 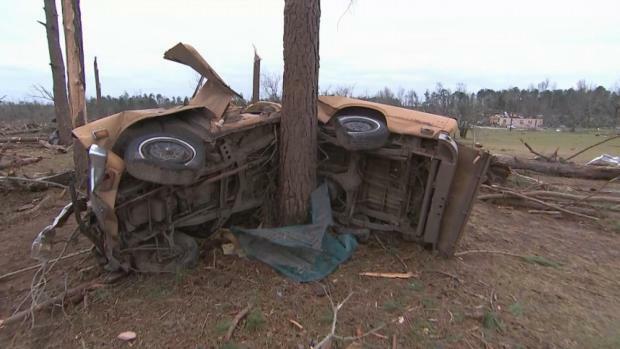 The devastating tornadoes that cut through eastern Alabama killed 10 members of Jones' family, including her parents — she found her father's body — along with her brother and a cousin. "I just got so many questions, but you know, you don’t question the Lord," said Jones, 52, on Wednesday. "Just why, why, you know, why? Why this had to happen like this? To everybody that you know and love? At one time? Why?" Jones had raced to her parents' house in Beauregard after the tornadoes hit, but she found nothing standing and has been rocked by the experience: "I ain't getting through it good at all."